The Flintstones came to the San Bernadino Symphony... along with the Jetsons, Huckleberry Hound, Yogi Bear, and many other Hanna-Barbera cartoon themes for a special benefit concert arranged and conducted by Robert Wendel. This is but one example of the "special services" that can be provided by Robert Wendel as conductor/arranger! 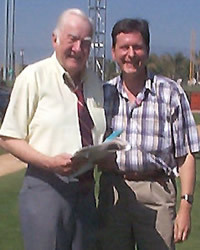 Robert Wendel with Hanna-Barbera composer Hoyt Curtin. 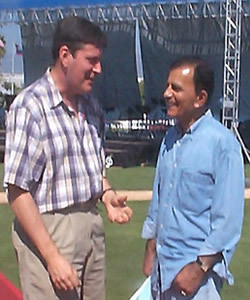 Robert Wendel with concert host and Scooby-Doo voice Casey Kasem. 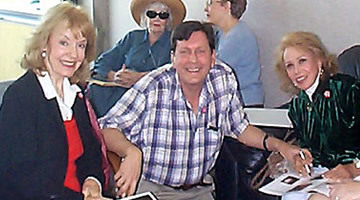 Robert Wendel with voice actors Janet Waldo (Judy Jetson) and June Forey (Jokey Smurf, Rocky the Flying Squirrel, Natasha Fatal, and many others).